Between dragon attacks, goblin invasions, and evil necromantic cults, everyone needs an opportunity to unwind and relax. 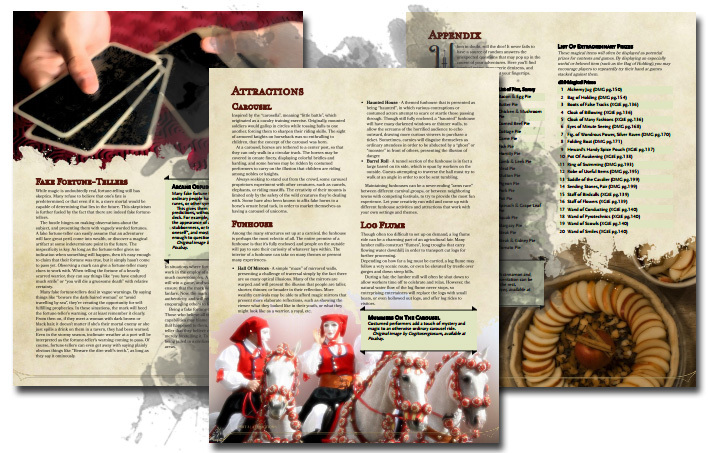 Festivals, Feasts & Fairs is designed to turn your “pleasant downtime” into a fully interactive experience. Still not convinced? Find out what other satisfied readers are saying! Can i have a version without the background texture? It's not printing well, and i can't get the layer to disable on my end. Thanks! Wow, that's a really good question! I don't know if I can include multiple PDF options with a product, but if I can, I'll include a printer-friendlier version. If not, I may simply be able to e-mail you a copy. I'll look into it and get back to you! Okay neat. I hope drivethru has that sort of setup. I have printer-friendly versions of Limitless Adventures' products, but i'm not sure where i got them. I'm using some stationary from Southworth, and it's nifty and inviting. upc 83514870857, if you're interested.